CK2 is a ubiquitous and pleiotropic Ser-/Thr-targeting acidophilic protein kinase. CK2 plays an important role in the aberrant proliferation of malignant cancer cells. 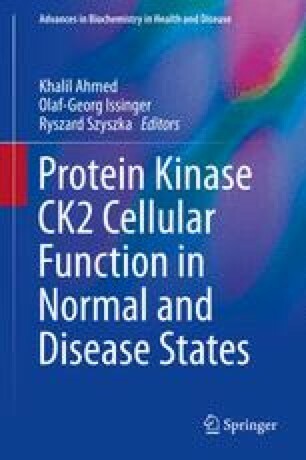 Because of constitutive activity of CK2, its inhibitors have been widely used to analyze the physiological function of CK2 in cellular systems. In addition, CK2 inhibitors are regarded as promising cancer chemotherapeutic candidates. Recently, several commonly used CK2 inhibitors have been shown to suppress DYRK (dual-specificity tyrosine-phosphorylation-regulated protein kinase) family protein kinases. Thus, the results obtained with conventional CK2 inhibitors should be carefully interpreted considering their effects on DYRKs. In this chapter, after an introductory section on CK2 and its inhibitors, the structures and activation mechanism of DYRK family protein kinases are portrayed. DYRK1A is one of the pivotal factors encoded in Down’s syndrome critical region on human chromosome 21, and dysregulation of DYRK1A may be a molecular basis of various phenotypes observed in Down’s syndrome patients. Substrates, physiological function, binding partners, regulatory mechanisms, and CK2 inhibitor sensitivities of DYRK1A are described in detail. Finally, the biological and clinical importance of CK2 and DYRK1A as therapeutic targets will be discussed.